This is an awesome app. It hasn't been released yet due to licensing issues with the underlying PDF rendering library IIRC. But the work is in progress to get it out. Friday was the Toy Show day. If you didn't attend, check out the video online, it was quite a show with a lot of interesting and inspiring demos. I went to a session called "Comparing the Developer Experience of Java EE 5.0, Ruby on Rails, and Grails: Lessons Learned from Developing One Application". Having a year of experience developing Rails applications and a couple of years on and off with JaveEE, I was mainly interested in seeing how Grails compares to these two. The session was somewhat disappointing, mainly because the guys running the session were coming from the JavaEE world and all they were trying to prove was that JavaEE is still the best choice nowadays. Don't take me wrong, JaveEE is certainly a cool technology and has its place in the industry, but there are often better ways to solve some problems or parts of complex problems. The worst of all was their benchmarking strategy. Comparing Rails running on WEBrick to Grails and JaveEE applications running on Glassfish and Sun Java System Application Server is nonsense. That's like comparing PHP application with Derby backend to JavaEE app with an Oracle or Postgres cluster as the backend. I think that there is a pretty good reason why Sun doesn't bundle Java with Postgres as Java DB but uses Derby instead. WEBrick has it's place in the Rails world, but it's certainly not a production server that scales well. Also if you create a CRUD application in Rails using the scaffold method instead of the scaffold generator, as they did, you might as well recompile your JSP pages for each request in the JavaEE application to be fair. So the benchmark was flawed for many reason. I wish they benchmarked the Rails app deployed on a recommended production setup or even more interesting would be to see how the Rails application deployed as a WAR on Glassfish performs. This is one of the things that is on my long TODO list to do after JavaOne. I also went to a Java DTracing session ("Cranking Up Java Application Performance with DTrace"). Adam Leventhal, one of the creators of DTrace, obviously knew what he was talking about and Jarod Jenson, a consultant specializing on DTrace was truly amazing - throughout the session he was typing like a crazy monkey and DTracing applications in real time! If they make a video of this session available online, this is definitely something you want to see :). It wasn't big news that it was possible to DTrace Java applications. The limited support was there in JDK 5.0, but with JDK 6.0 things have improved by heaps. There is a lot of new probes in the JVM and these probes can be enabled without even restarting the application! JDK 7.0 will bring support for creating user defined probes in Java applications. This will be a major step forward. 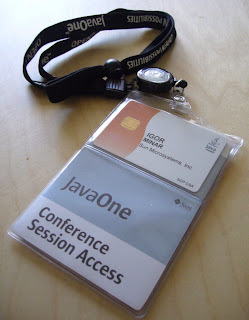 Overall JavaOne was really good, I had a lot of fun and enjoyed it a lot. Too bad that it lasts only four days. I'm already looking forward to next year's conference and I'm definitely going to do everything in my power to come again! Roumen posted a blog entry about Sun's commitment to create "Consumer JRE". This is exactly what JavaFX needs in order to blow Flash away. Btw, I've been using Netbeans 6 M9 as my main development environment for almost two weeks now, while working on numerious Java and Rails projects. The stability of this build is fantastic. I don't recall seeing any major or even minor issues. Joshua Bloch did a great job at his Effective Java session. The presented Builder pattern (among others) is something I'll definitely use next time when the need surfaces. since JFX is using AWT/Swing internally, it is possible to embed existing GUI components and display them via JFX. The same is true for trying it the other way around - embedding JFX elements into exising Swing applications.